Does your throat feel tired, feel sore or even disappear after teaching, singing, coaching, talking at the front desk, a night out or even coughing? Come to get your voice condition screened. Questionnaire, perceptual voice evaluation and computerized voice analysis will be conducted. You will be advised whether you are at high risk or may already have voice disorders. 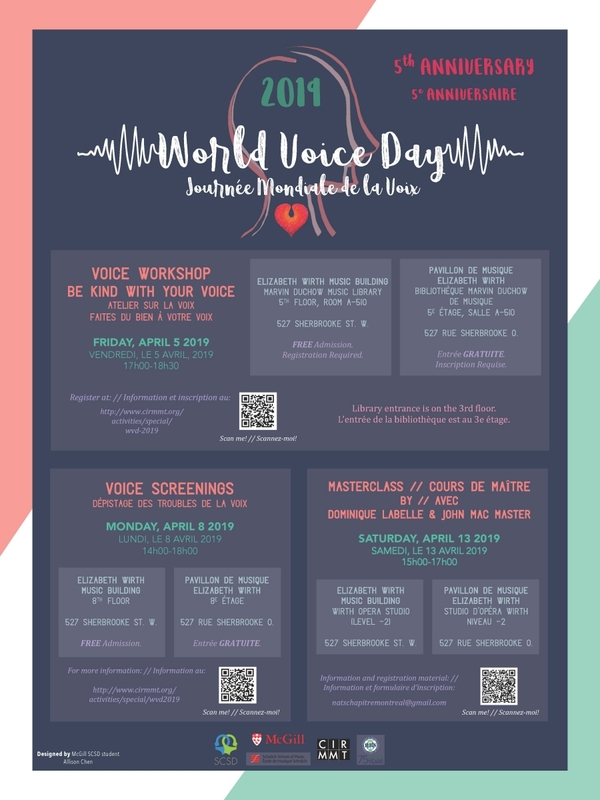 If unfortunately so, you will be referred to our World Voice Day Ear-Nose-Throat doctor at MGH for further medical consultation. Date: April 8th (Monday) 2:00 p.m. - 6:00 p.m.
Place: Strathcona Music Building lobby, 555 Sherbrooke St. W.
Chronic cough is one of the most common reasons for adults to seek medical attention and affects up to 10% of the general population. Approximately 40% of those with chronic cough report accompanying voice problems. Speech-language pathology students and Dr. Nicole Li-Jessen from the School of Communication Sciences and Disorders will host a 90-minute workshop on voice care and chronic cough. Date: April 5th (Friday) 5:00 p.m. - 6:30 p.m.
Place: Elizabeth Wirth Music Building Rm A-510, 527 Sherbrooke St. W.